It is no secret that location-based marketing is fast changing the way consumers interact with brands around them. According to a report by the Location Based Marketing Association, 75% of marketers believe location-based marketing is an important element of their business strategy. One of the primary reasons why location-based marketing is so popular among both marketers and consumers is that it eliminates the need to push irrelevant ads. Not surprising, given that location-based advertising has been proven to be 20 times more effective in providing returns than the generic banner ads. Does this remind you of another marketing strategy that has taken the world by storm of recent – proximity marketing? Well if it does, that’s primarily because both of these- proximity marketing and location-based marketing – still have quite a lot in common, in spite of being two fundamentally different marketing strategies. In this blog, we will take you through the different terms that define these technologies and help you gain a solid understanding of what they stand for. Once that is done, we will throw some light over how location-based marketing differs from proximity marketing and which one should your business opt for. But before we dive deep into that, let’s first take a look at what exactly does location data offer your business, and how you can use it to drive your marketing decisions and engage better with your audience. Location-based marketing vs proximity marketing: Which one should your business opt for? What does the ‘where’ factor mean to businesses? Firstly, location intelligence allows businesses to take the best step forward by equipping them with a good amount of crucial context to audience information that they have gathered. These contextual insights can be drawn from a wide array of sources that bring depth and diversity to organisational processes, ranging from smartphones to wearables, Internet of Things (IoT) devices to WiFi routers to beacons, and navigation providers. For example, the location allows businesses like yours to map a consumer’s habits – such as the stores that he/she frequently shops at, the time of day that he/she commutes at etc., – to boost conversions. It allows you to fine-tune your marketing strategy by identifying the best channel, time and place to target your consumer, as well as personalize your messages. Location-based marketing or proximity marketing is defined as the use of mobile marketing to target consumers within a particular geographic area. In other words, the location of a consumer is determined by attaining the longitude and latitude of his/her mobile device through GPS or cell tower triangulation. This allows you to engage with the consumer via an app or on a website. It goes without saying that, there are a quite a number of measures that define a good geofence or virtual barrier set up by a business to define a geographic boundary. In terms of being able to reach out to the consumer, a geofence could range anywhere from over 50,000 meters to anything less. However, 100-meter accuracy is considered be average in the world of location-based marketing. As a basic thumb rule, any business looking to leverage location-based marketing to interact with their consumers within a distance of above 50 meters, should consider GPS and geofencing. As location becomes more central to advertising, companies are utilizing this data to reach customers at scale who are in the right context to consider or act. Snapchat has recently introduced location categories and radius categories to make the ads appearing more meaningful. For example, a swimsuit brand can reach Snapchatters at beaches nationwide, or a movie studio can reach them at the theatre. Advertisers can also get more specific by narrowing down their location categories by state, city, DMA, and more. (1) Geofencing: Geofencing is defined as the practice of using global positioning (GPS) or radio frequency identification (RFID) to define a geographic boundary. Once this virtual barrier has been established, it allows businesses to set up triggers that send a text message, email alert, or app notification to a consumer’s mobile device when he/she enters (or exits) the given geographic area. (2) Geo-targeting: Geo-targeting is defined as the practice of delivering content to a consumer based on his/her geographic location. This can either be done in the city or zip code level via IP address or device ID, or on a more granular level via GPS signals, geo-fencing, and more. Proximity marketing is defined as a more granular form of location-based advertising, wherein the primary focus lies in making the communication with a consumer as timely, relevant and personal as possible. In other words, it allows businesses like yours to leverage the accurate location of a consumer (down to a few meters) to engage consumers with contextually relevant notifications. This also means that with proximity marketing businesses can now determine the location of a consumer’s mobile device on a department inside a store level. Few of the most common technologies that are leveraged for proximity marketing include Beacons, Near Field Communication (NFC) and Wi-Fi. How is location-based marketing different from proximity marketing? Location-based marketing works better when it comes to targeting consumers in a larger geographical area: As mentioned earlier, most location-based services are n’t that precise when it comes to being used indoors. On the other hand, it’s perfect if you are looking to promote your product or service within a larger area. For example, say you run a coffee shop and you are looking to send out a mobile ad to people who are within a specific radius of your coffee shop’s location. In this scenario, location-based marketing using geofences seems to be the best way forward. Proximity marketing works better when it comes to targeting consumers indoors within 50 meters at most: As mentioned earlier, proximity marketing makes it possible for you to track a consumer’s mobile device within a building or any other place, where the GPS would otherwise fail. Thus, by allowing you to reach out to consumers within the range of 50m, beacons can help you target consumers based on which department they have spent most time in-store, how long they have been looking at a particular product or brand on a shelf and more. Which one of them should my business go ahead with? In most cases, a combination of both – location-based marketing and proximity marketing – is the best way ahead. While some of the most successful campaigns run by brands, initially leveraged location to kickstart a seamlessly engaging conversation with their consumers, they eventually went on to leverage proximity at a later stage. Which of these marketing strategies do you plan to employ in your next campaign? Let us know in the comments below. 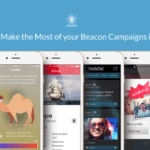 Also, if you are planning to try out beacons, take a look at Beaconstac, that includes everything you need to get started. Using Beaconstac you can set up your own campaign, without a developer’s help!